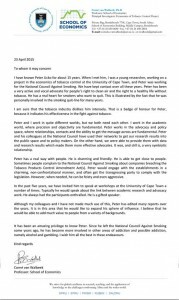 I am writing this letter to endorse Peter Ucko strongly as a research collaborator, editor and writer. I am currently a director in the Economic and Health Policy Research unit at the American Cancer Society in Atlanta, USA, and I have worked with Peter for over five years and can speak directly to his work. 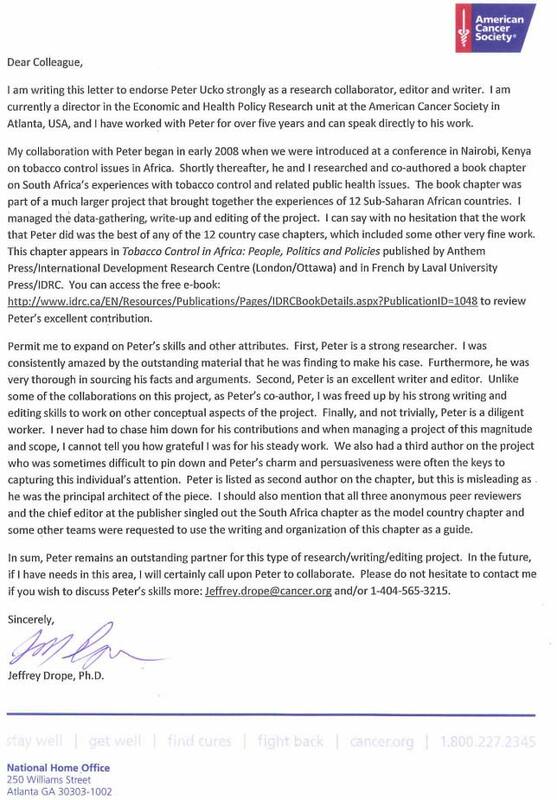 My collaboration with Peter began in early 2008 when we were introduced at a conference in Nairobi, Kenya on tobacco control issues in Africa. Shortly thereafter, he and I researched and co-authored a book chapter on South Africa’s experiences with tobacco control and related public health issues. The book chapter was part of a much larger project that brought together the experiences of 12 Sub-Saharan African countries. I managed the data-gathering, write-up and editing of the project. I can say with no hesitation that the work that Peter did was the best of any of the 12 country case chapters, which included some other very fine work. This chapter appears in Tobacco Control in Africa: People, Politics and Policies published by Anthem Press/International Development Research Centre (London/Ottawa) and in French by Laval University Press/IDRC. You can access the free e-book to review Peter’s excellent contribution. Permit me to expand on Peter’s skills and other attributes. First, Peter is a strong researcher. I was consistently amazed by the outstanding material that he was finding to make his case. Furthermore, he was very thorough in sourcing his facts and arguments. Second, Peter is an excellent writer and editor. Unlike some of the collaborations on this project, as Peter’s co-author, I was freed up by his strong writing and editing skills to work on other conceptual aspects of the project. Finally, and not trivially, Peter is a diligent worker. I never had to chase him down for his contributions and when managing a project of this magnitude and scope, I cannot tell you how grateful I was for his steady work. We also had a third author on the project who was sometimes difficult to pin down and Peter’s charm and persuasiveness were often the keys to capturing this individual’s attention. Peter is listed as second author on the chapter, but this is misleading as he was the principal architect of the piece. 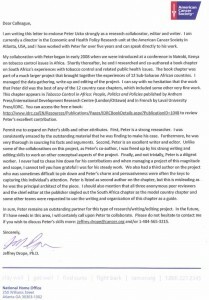 I should also mention that all three anonymous peer reviewers and the chief editor at the publisher singled out the South Africa chapter as the model country chapter and some other teams were requested to use the writing and organization of this chapter as a guide. In sum, Peter remains an outstanding partner for this type of research/writing/editing project. In the future, if I have needs in this area, I will certainly call upon Peter to collaborate. Please do not hesitate to contact me if you wish to discuss Peter’s skills more: Jeffrey.drope@cancer.org and/or 1-404-565-3215. I have known Peter Ucko for about 15 years. 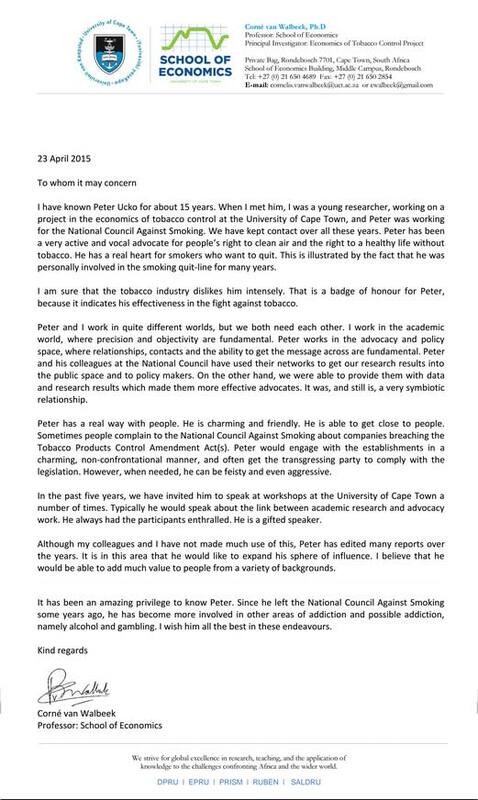 When I met him, I was a young researcher, working on a project in the economics of tobacco control at the University of Cape Town, and Peter was working for the National Council Against Smoking. We have kept contact over all these years. Peter has been a very active and vocal advocate for people’s right to clean air and the right to a healthy life without obacco. He has a real heart for smokers who want to quit. This is illustrated by the fact that he was personally involved in the smoking quit-line for many years. I am sure that the tobacco industry dislikes him intensely. That is a badge of honour for Peter, because it indicates his effectiveness in the fight against tobacco. Peter and I work in quite different worlds, but we both need each other. I work in the academic world, where precision and objectivity are fundamental. Peter works in the advocacy and policy space, where relationships, contacts and the ability to get the message across are fundamental. Peter and his colleagues at the National Council have used their networks to get our research results into the public space and to policy makers. On the other hand, we were able to provide them with data and research results which made them more effective advocates. It was, and still is, a very symbiotic relationship. Peter has a real way with people. He is charming and friendly. He is able to get close to people. Sometimes people complain to the National Council Against Smoking about companies breaching the Tobacco Products Control Amendment Act(s). Peter would engage with the establishments in a charming, non-confrontational manner, and often get the transgressing party to comply with the legislation. However, when needed, he can be feisty and even aggressive. In the past five years, we have invited him to speak at workshops at the University of Cape Town a number of times. Typically he would speak about the link between academic research and advocacy work. He always had the participants enthralled. He is a gifted speaker. Although my colleagues and I have not made much use of this, Peter has edited many reports over the years. It is in this area that he would like to expand his sphere of influence. I believe that he would be able to add much value to people from a variety of backgrounds. It has been an amazing privilege to know Peter. Since he left the National Council Against Smoking some years ago, he has become more involved in other areas of addiction and possible addiction, namely alcohol and gambling. I wish him all the best in these endeavours.